If you’ve got a special project in mind that requires a unique trailer design, ask Fred for a custom built tiny house trailer. Get all the specifications you need as well as Fred’s support in making informed decisions on your design. If you have a design problem with your tiny house trailer, we can help you solve it. Weather it’s how to use SIP panels or how to distribute weight on your trailer, we can help you. 3 hours of free consultation with Fred to answer any questions about your build (valued at $210). Free entry to all 4 workshops run at different locations in Australia (valued at $288). A free basic framing plan and SketchUp file that fits your trailer like a glove and can be customised to fit your unique floor plan. 1 night free accommodation in Fred and Shannon’s tiny house when picking up your trailer from Castlemaine (interstate pick-up only, availability permitting). Underfloor storage – perfect for deep cycle batteries or extra storage space. A truly insulated floor in your tiny house with no thermal bridging. Australian materials and built with ethical employment practices and wages. 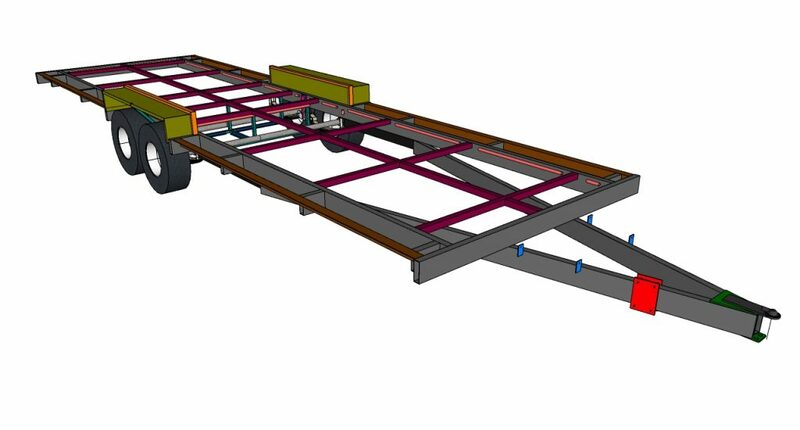 The knowledge that all the essential elements of our trailer designs are made in consultation with VASS engineers ensuring the strongest and safest foundation for your tiny home on wheels. Extra cabling for legally required outline marker lights front & rear. See our video that runs through all these features. Fill out our online Order Form specifying your trailer. Make an initial and refundable Good Faith Deposit of $995 by direct deposit or Stripe. This establishes your place in our manufacturing queue. We send you a quote reflecting the exact details of your trailer purchase, making sure it is a perfect fit with your tiny house design. We’ll send you a sales agreement to sign. Pay the 50% deposit (minus the $995 already paid). Pay the remainder just prior to pick up or delivery.